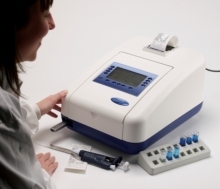 Commonly included in chemistry courses to demonstrate the principle of using light to measure concentration, analysis of aspirin tablets can be carried out accurately by two different methods using Jenway's 73 series spectrophotometers. A new Jenway Application Note¹ describes and compares how to determine the concentration of acetylsalicylic acid in aspirin tablets, using both the UV and visible wavelength capabilities of the 73 series spectrophotometers. Method 1 measures salicylic acid's absorption maxima at 303nm while Method 2 quantifies a violet coloured complex at 530nm after salicylic acid has been derivatised with Fe(III). Three tablets were tested using each method and the results and standard deviations are given in the Application Note. Pharmaceutical manufacturers routinely use the acid/base titration method to check the aspirin content of commercial tablets. However, assay results obtained using the two methods for the 73 series spectrophotometer gave values in agreement with the manufacturer's own test results for the batch of tablets used in the Jenway study. This finding demonstrates the value of UV and visible wavelength spectroscopy for the quantitative determination of aspirin concentration within an educational context.